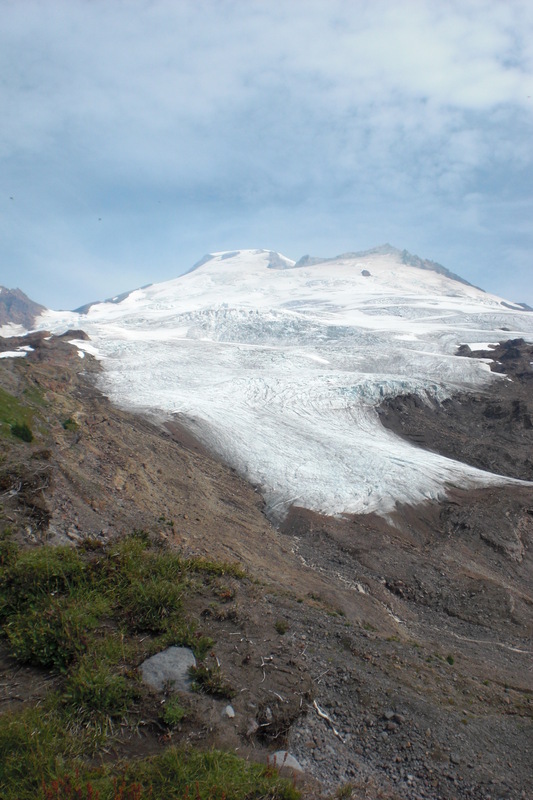 This paper was just published, Methods for assessing and forecasting the survival of North Cascade, Washington glaciers. It represents the third in a series of papers that looks at methods to identify when an alpine glacier will not survive. The first paper was using the change in thickness along a profile up the center of the glacier. Glaciers that were thinning appreciably and similarly along their entire length were determined to be in disequilibrium and would not survive. The second paper looked at glaciers that experienced thinning in the accumulation zone as distinguished by emergence of bedrock outcrops, marginal recession in the accumulation zone and overall accumulation zone thinning. Glaciers that were thinning in the accumulation zone were forecast to not survive. In this paper the model is expanded to look at the percentage of a glacier that is snowcovered at the end of the melt season. This is the accumulation area ratio. Typically a glacier needs to be 60% snowcovered or more at the end of the melt season to have an equilibrium balance. If the glacier has an AAR of less than 30% frequently, those glacier have been noted as thinning appreciably in the accumulation zone and will not survive. To survive a glacier must of course have a persistent accumulation area, as snow is the income of the glacier. A glacier that lacks such a zone, then has only a melt zone-ablation zone, and only liabilities and will go out of business. Lets look at three glaciers that exemplify this issue. The first and third are forecast not to survive current climate, the middle glacier will. The first is Lynch Glacier the pictures are from 1960 and 2007, in the upper left of the glacier-the accumulation zone, you can note the emergence of bedrock outcrops, Point B. This indicates that snowcover is not persisting and this has become a melt zone even though it is near the head of the glacier. The second is Easton Glacier. 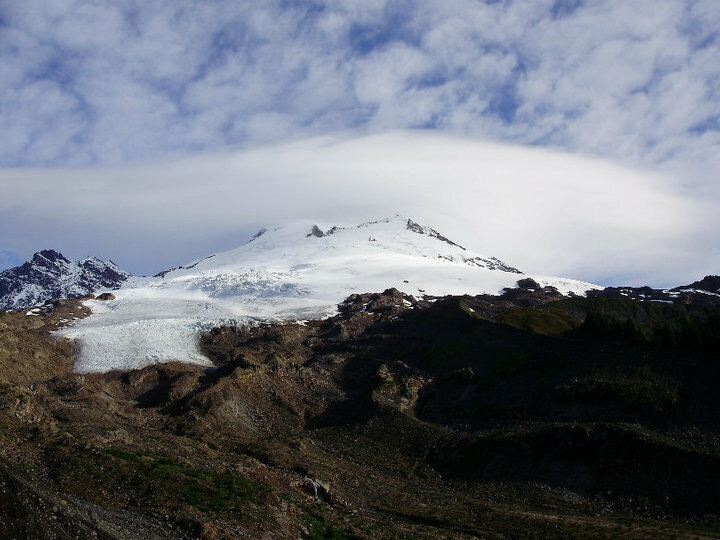 This glacier descends the south side of Mount Baker. Even in the years with the poorest snowcover, such as 2009 the glacier remains snowcovered to the end of the summer over the upper third of the glacier. This image is from mid-Sept. 2009, mid-Sept. 2010 was a much better year. 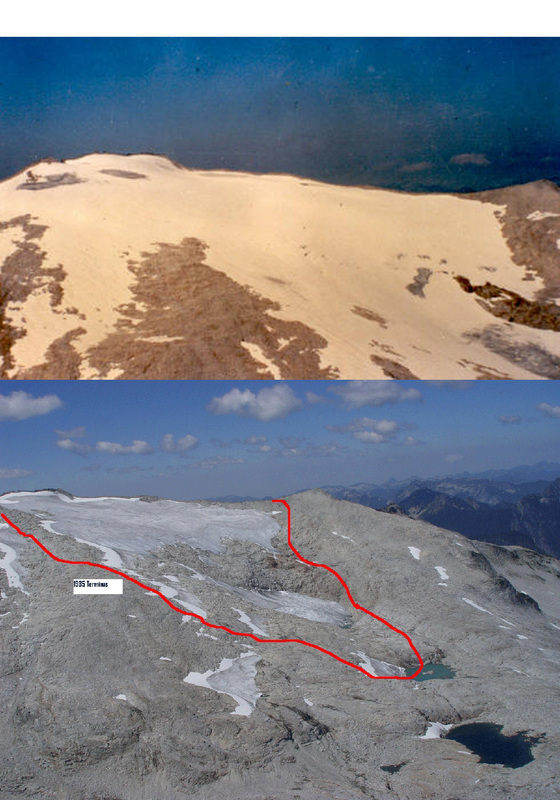 The last glacier is Foss Glacier which shows considerable shrinkage in the upper reaches of the glacier, what should be the accumulation zone, here the glacier is seen in 1985 and 2005. . Also notice the lack of an accumulation zone in 2005. 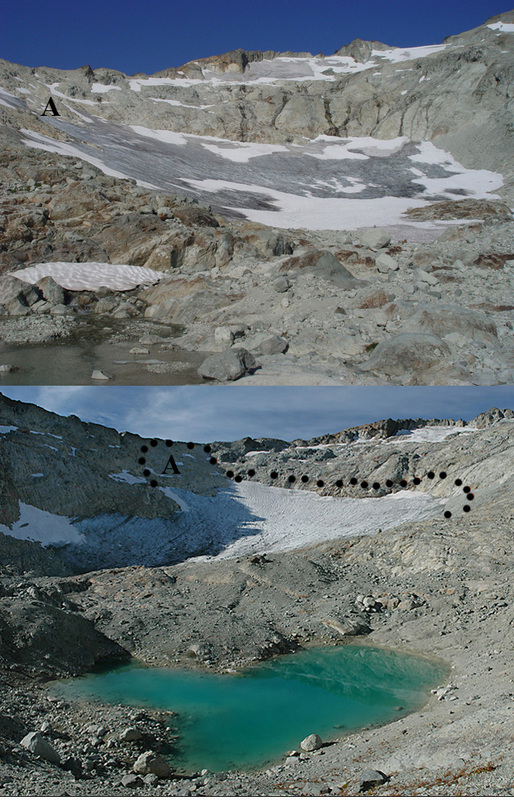 This was the case that summer on Columbia Glacier (above) and Ice Worm Glacier (below) as well. 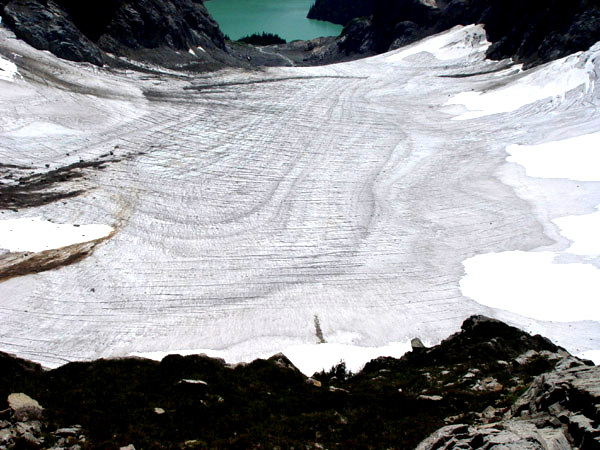 2003, 2004 and 2009 were other years in which accumulation was not retained on many North Cascade WA glaciers. The picture of Ice Worm Glacier contrasts the glacier from 2005 to 2009. The picture indicates more retreat at the top of the glacier at Point A.